Imagine a place where art and commerce intersect. A former bank filled with creative energy, a magnificent historic landmark tenderly restored as a counterpoint to newly built modern structures – a site where talented visual and performing artists create, rehearse, mingle and showcase their work – a place devoted to Westchester arts and artists. ArtsWestchester is a place where artists and audiences can expect the unexpected, where ideas, discussion and art go hand-in-hand. A small corner in the heart of downtown White Plains that reflects the heart of a city. That was the dream of ArtsWestchester when we restored the People’s National Bank at 31 Mamaroneck Avenue, formerly a Chase bank, and recreated it as our current home. It now hums with activity in downtown White Plains, furthering our mission of making the arts available and accessible, offering something for everyone… a work of art all its own. • Throw a party at the ArtsWestchester! 2400 sq ft with 25 ft, vaulted ceilings, 20 ft palladian windows, a grand staircase, original steel bank vault & brand new full kitchen. 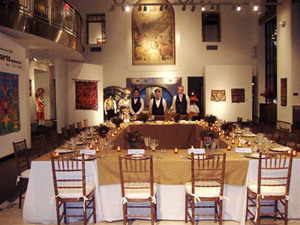 600 sq ft, with 400 sq ft Sculpture Court. For more information, please contact Kathleen Reckling at 914.428.4220 x306 or [email protected]. Your creative business deserves a creative home. ArtsWestchester welcomes arts-related businesses to become tenants in our historic building. Why work in isolation when you can connect with your peers each day in the hallways and elevators at ArtsWestchester? We have office space for rent in a variety of sizes at very competitive prices. Please send an email to [email protected] (subject line: office space) for more information about rentals, or to schedule a tour of the building. ArtsWestchester, located at 31 Mamaroneck Avenue in White Plains is not just the home of New York’s largest arts council—it is the home of about 20 artists and arts-related businesses. 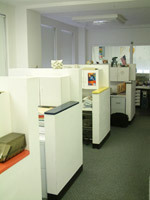 Why work in isolation when you can connect with your peers each day in the hallways and elevators at ArtsWestchester? 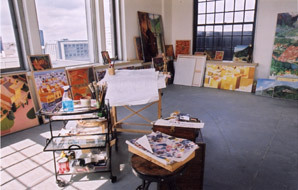 We have competitively priced studios for rent in a variety of sizes. Please email Christy Barattino for more information on available studios or to schedule a tour of the building. Business Matthew L. Kletter Esq. ArtsWestchester is pleased to provide cultural organizations and other not-for-profit organizations with low-cost space for rehearsals, small conferences and meetings at our building. Our 9th floor facility offers 2 rooms (506 square feet and 927 square feet, respectively), with, 110V power outlets, WiFi, restrooms and plenty of natural light. Daily and weekly rates are available, plus a $250 key deposit is required if you will use the space outside of regular business hours. The space is available by reservation, Monday-Friday, from 9am to 10pm, Saturdays from 12pm-6pm. Reservation requests are accepted no more than three months in advance. To inquire about reserving the space, please contact the main office at 914-428-4220.